As I've mentioned in previous articles, scientists often look to the animal kingdom for inspiration and innovation in design. The Wright brothers documented bird behavior before their initial attempts to take to the skies. And similarly, as the field of robotics gets smaller and smaller, engineers are looking to the insect world for inspiration and guidance. Speaking of the insect world, there's a phenomenon that occurs in Hollywood known as "twin films." The term refers to when separate studios release similar films at the exact same time. A classic example of this would be DreamWorks' Antz and Pixar's A Bug's Life, which were both released in 1998. There are countless instances of "twin films": An American Werewolf in London and The Howling in 1981, and also Finding Nemo in 2003, which was followed by Shark Tale in 2004. This same situation often happens in the realm of robotics, too. Within the past few weeks, we've seen that exact scenario occur between robotics labs in the U.S. and China. 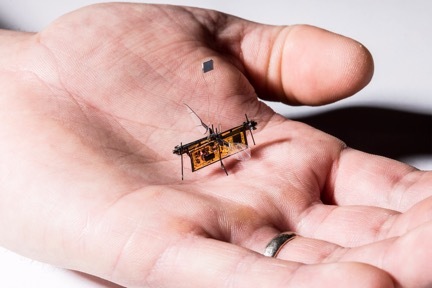 The team behind it calls it the "RoboFly." And it's essentially a tiny drone. 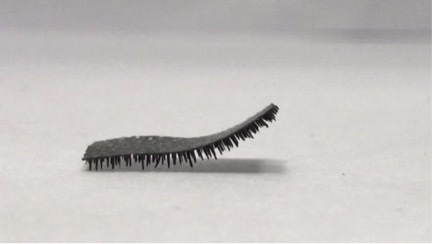 The UW robot is a little heavier than a toothpick and about half the length of one. It operates on a laser system and will be used in situations that are too tight for the larger, more unwieldy drones to operate. The intention is that this robot would be able to fly through a pipeline and sniff out gas leaks, move around fields in a farm to find pests or illness, or buzz through ruined buildings to find disaster survivors. Sign up for the Wealth Daily newsletter below to stay on top of the greatest value investment ideas... You'll also get our free report, Seven Strategies for Tech Investing. After getting your report, you’ll begin receiving the Wealth Daily e-Letter, delivered to your inbox. The Chinese robot looks hairy. But it's actually covered with hundreds of legs that are each less than 1 millimeter long. The research team at CityU studied the leg structures of thousands of animals with two to eight legs. It was there that the team found its inspiration for the model. "Most animals have a leg-length to leg-gap ratio of 2:1 to 1:1. So we decided to create our robot using 1:1 proportion," explained Dr. Shen Yajing, an assistant professor at CityU. Yes, besides a flexible body, this robot also has an incredible loading capacity. Much like an ant, the milli-robot can carry up to 100 times its own weight. It's a strength that it'll need in order to deliver medicine throughout the human body. Of course, this robot is still in early trials. The Chinese research team is hoping to produce a biodegradable robot that will decompose naturally after its medicine delivery. So, on one hand, we have an incredibly strong robot that's capable of carrying 100 times its own weight and surviving in environments as harsh and acidic as the human digestive tract. On the other hand, we have an American-made, toothpick-sized robot controlled by lasers.